I am trying to install QEMU and the procedure described in the first post works for me until the ./install.sh step. I also checked that this folder exists and is populated with files. However, the script still exits at the same point... I restarted the bash with no success. It may be obvious for practitionners, but my experience of linux is quite limited. I am running Windows 10 with Ubuntu installed as per first post. Incidentally I was currently testing QEMU installation on WSL and noticed the same issue - try "hg pull; hg update qemu -C" to get the fix. No guarantees the next steps are actually working - will try them later after a short break. edit: seems to work; still want to re-test on a fresh installation. I guess the best choice is option 5. However I am not sure how to install this from https://launchpad.net/gcc-arm-embedded. Which command line should I use? For trying out current stuff, I hope option 4 should work fine (that's also because most of the GDB patches that were causing trouble are no longer needed). For 5, just unzip a Linux 64-bit build in your home directory and add it to your PATH. I've ran some parts of the test suite with gcc-arm-none-eabi-6-2017-q2-update, gcc-arm-none-eabi-6-2017-q2-update and gdb 8.0.50.20171008-git (all 64-bit) and worked fine. However, if I get the 5D3/patches.gdb back from changeset 93e57ce57802 and intentionally break the RTC emulation - so the patch will execute something - all these 3 64-bit versions will fail. The 32-bit gdb from gcc-arm-none-eabi-5_4-2016q3 (and any other 32-bit versions I've tried) will work just fine. Recently I've managed to crash the 32-bit gdb on 5D classic code, and the 64-bit gdb 8.0.50.20171008-git worked to some extent (so, the 32-bit GDB isn't bug-free either). My conclusion so far: for serious GDB use on DIGIC 4 and 5 firmwares, you are more likely to get in trouble with a 64-bit GDB (but you should still be able to run the examples from the QEMU guide). 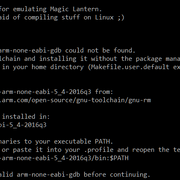 Do you get any output if you type arm-none-eabi-gdb at the bash prompt? Hm, it (or maybe you) somehow downloaded the 32-bit toolchain (which WSL can't run), and you have added it to PATH. If you ran the command suggested by the script, close the bash window and open a new one, as that change is temporary. Made some WSL changes to QEMU install script, but for some reason I'm unable to bring the Win10 VM back to life (and I'm not currently on a fast internet connection either). Would appreciate some help with testing latest changes (both from scratch and on top on some existing installation). Please include an installation log, if possible, or some screenshots from the process (for example, the prompts you may get during installation). Thanks. Okay, that must be a newer git than what I've tested; will check. 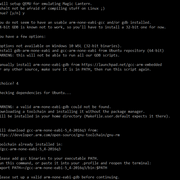 git add . && git commit -q -m "$QEMU_NAME vanilla"
Okay QEMU compiles with no extra errors after adding your extra line to the script. I am now at the step of running ./run canon_fw.sh 6D. However it errors because it cannot open /6D/SFDATA.BIN. If I understand well, I should be able to retrieve this file by running some module sf_dump on my 6D. However, I do not see this module on the ML camera menus. Where is it? It's covered under Installation (no binary available yet, but I should provide one). Finally, when starting my 6D with the SD card, I could load the sf_dump module and run it to get the SFDATA.BIN. You need to install an X server (see earlier in this thread) and export the DISPLAY variable. This step is specific to WSL. 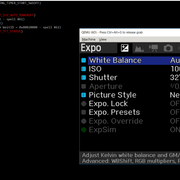 Make sure you can run other GUI programs (such as gitk). Press M and start navigating the menu. For some reason, the 6D starts with main display off - was your camera configured that way before dumping the ROM? Or press I(nfo) to turn it on. The red messages are printed by Canon firmware to the serial console. I'd like to generate the zebras and histogram I get with ML on the real camera. env QEMU_EOS_VRAM_PH_QR_RAW='/path/to/IMG_1234.CR2' ./run_canon_fw.sh 6D,firmware="boot=1", but I do not get anything. What is the procedure to emulate the capture from an image and the image review that we get right after? I need some assistance. I followed the instructions and got to the point where I can call up the QEMU window but I can't do anything from there. 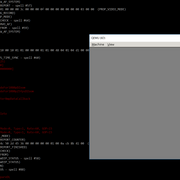 It looks like Magic Lantern is not loaded so I have nothing but the QEMU window. I tried pressing M for menu and all other combinations of buttons but nothing happens. How do I load Magic Lantern within the Ubuntu environment? Do I have to copy the contents of the nightly build somewhere? Thank you. Do I have to copy the contents of the nightly build somewhere? Yes, it needs to be in the sd.img or cf.img depending on which (virtual) camera you are using. I had some problems on the EOSM and it turned out there was a problem with the SFDATA.BIN file I was using. If you have a problem with the user guide or suggestions, a1ex is looking for feedback -- post it on the How to run Magic Lantern into QEMU?!... topic. Yes, I was following those instructions but as a linux newbie, I ran into a road block when trying to mount the sd.img file. I'm trying to setup the environment for the 5D3.123. I wasn't sure where to post the question since this is specific to the Windows 10 running Ubuntu so I thought this might be a good place. I ran make clean; make command in the platform/5D3.123 folder. But received a message that it can't find the path in /etc/fstab. When I listed the contents of fstab, it's nothing like the suggestions I found when searching for answer. It's probably due to the fact that it's a virtual environment in Windows. Any help would be appreciated. Reproduced; looks like mounting the images in WSL is different; however, it's not really needed. You should be able to use "make install_qemu".